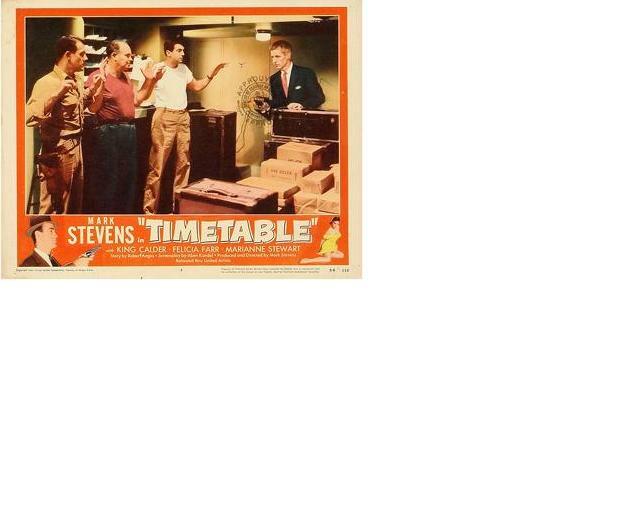 I just watched Mark Stevens’ excellent 1956 film noir Timetable. There was a funny movie trope during the robbery scene portrayed above. After the robber blows the safe, he steals “$500,000 in small bills”. The money is contained in two small satchels each about the size of a woman’s purse, which he almost daintily lifts and then tosses into his suitcase. In real life, a piece of US currency is .0043 inches think and weighs about a gram. If we assume the average “small bill” is a $10 note and that the bills are all perfectly pressed flat with no wrinkles, the stack of bills should have been 17.92 FEET high and would have weighed just over 110 pounds! But in the movies, money is small and light. Countless caper films feature people nimbly running around with zillions of dollars in their small, lightweight satchels. Does anyone know any movies that undo this trope, for example by having a kidnapper not be strong enough to lift the suitcase with the ransom in it, or having a car axle bend under the weight of the multi-billion dollar haul in the back seat?